Below is a breakdown of common questions for Summer and Winter Camps. The Question Categories are broken into: General, Registration, Camp Forms, Travel, & Camp Life. Is there a performance / time requirement? No. We accept athletes of all abilities, ages 11 through high school senior. Are there age restrictions for camp? Average age is ~14 years old. High altitude and novel trail running put unique stresses on the body that have favorable effects to distance running performance, and is just one aspect that makes Team Prep USA camps unique. Many of our campers are traveling from sea-level regions, and the adjustment to altitude is something we take seriously. Each athlete is different, with altitude adjustment generally taking 2-5 days. HYDRATE! We have water stations throughout each run, in the camp lecture halls, and for every activity. We partner with Dr. Roanne Houck, creator of Acclimate Natural Sport Drink, which is formulated to help with altitude adjustment. You can prepare for altitude by making sure you are getting enough sleep prior to camp (and importantly during camp), eating a full and nutritious diet, and hydrating enough. Athletes also utilize Acclimate the week prior to jumping to altitude to help with the transition - we will also be selling this at our camp store. Camp has sold out each year and is on a first-come, first-served basis. As Team Prep USA grows, the time window for registration will get shorter! Which session is right for me and what is the difference? Each session is appropriate for each age (11 - senior) and experience level. The 4, 8, and 10-night camps all take place within the Main 20-night camp dates. Pre-Camp and Summer Distance Project are 7-night and 14-night sessions that take place before and after the Main 20-night camp, respectively. These smaller, more intimate groups, are able to experience different trails and activities not possible with a larger group. 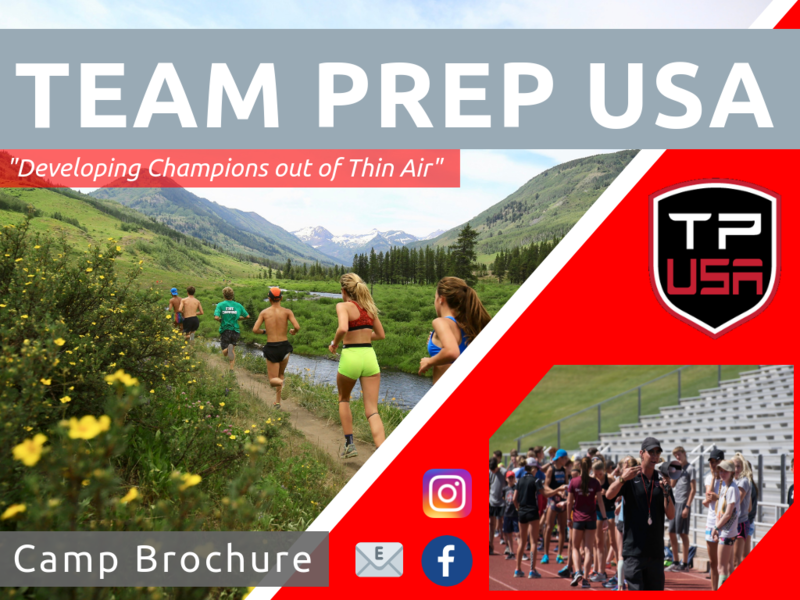 Pre-camp and main camps are housed in the Western State University dormitories; Summer Distance Project in downtown Crested Butte. To get the most out of your travel expenses and camp experiences (participate in all the lectures, running routes, night-time activities, altitude adjustment) we recommend the 20-night camp. There is a 5% discount for campers that attend both the pre-camp and 20-day camp session. When is the registration/final payment deadline? What needs to be to Team Prep USA by June 10? Log into your ACTIVE account to access your registration status. A deposit of $450 is required to reserve your spot at camp. When purchasing camp, you may pay in full, or select monthly installment payments. This is an option upon checkout. Upon checkout, you will be given the option to purchase Registration Protection. With Registration Protection, you’ll be able to receive a full refund of the purchase price and processing fee should you be unable to attend your event due to a specified reason, such as: injury or illness, vehicle breakdown or theft, adverse weather resulting in travel warnings, work relocation, and more. Full details here. ​Do I need to submit new forms every year? Camp Release forms are necessary for each camp. Your school's Pre-participation Physical Exam (PPE) will be accepted in place of the Team Prep USA Medical Clearance Form given that it has not expired (expiration dates or dates of validity may be found on your form and may vary). Are Letters of Recommendation necessary? For first time campers, yes. Over the years Team Prep USA has developed a large following and makes it a priority to protect the campers and clients that are already involved. Learn more about letters of recommendation HERE. Once Team Prep USA has received camp deposit/full payment, a registration confirmation email will be sent. Please note: a camper can not participate in camp activities until all forms (Medical Clearance & Camp Release) have been turned in, even if payment have been received. Check-in/check-out is at 11am on the day your camp session begins & ends, respectively. Note: We have campers coming in from all over the world for camp, and understand arriving/departing at exactly 11am will not be possible for everyone. We’ll be shuttling campers to/from camp all day. If you have to arrive/leave later/earlier that’s ok! The camper may miss an afternoon or morning run, but getting to camp is the priority. Making your travel plans in advance can help with timing and getting the most out of camp. Air, bus, or by car. Information can be found on our Travel Page. When you know your travel plans, fill out your Travel Itinerary Form by going to your ACTIVE Registration Account Page. This is mandatory regardless of travel mode (car, bus, air), as we need to know and plan for efficient check-in/out. Shuttles can be purchased on your ACTIVE Registration Account Page. Shuttles from Montrose Airport are $50 each way. The shuttle from Gunnison Airport and bus drop-offs is free. Campers arriving by air or bus will be picked up by a Team Prep USA staff member. This staff member will be wearing a Team Prep USA shirt and will be driving a Team Prep USA van. Gunnison and Montrose Regional Airports are quite small, with only one entrance/exit. Camp Staff will be monitoring flights and ready to receive newly arrived campers at the Ground Transport exit. Many campers will be arriving on the same flights/bus, and will be able to congregate together. Staff will ensure each camper gets checked in for flights or makes it onto their bus before departing. If your travel options limit you to arriving before check-in day (or departing after check-out day), we recommend staying at The Holiday Inn Express, on the Western State University campus. The Holiday Inn is a short walk away from the Team Prep USA dormitories, however we will send a camp-staff to pick you up/drop you off and get checked in. Unfortunately, we cannot house campers outside of the camp session dates. Are there laundry units available? Yes, there are coin operated washers and dryers available - bring coins or $1 bills for change! What are the rooms/boarding like? Campers are staying at Western State University dormitories for the pre-camp and main camp sessions, and will be sleeping on twin-sized mattresses. Post camp is housed in downtown Crested Butte condos. Campers will be sharing rooms with 1 other camper. There will be a boys dorm and a girls dorm with counselors staying throughout the floors. Rooms come with a desk, dresser, outlets, and is wifi-accessible. There are common rooms where we host activities and lectures that campers will be able to utilize. What is the linens package? Linens package includes 2 bed sheets & blanket, wash-cloth, hand-towel, and bathing towel. The alternative to a linens package is bringing your own linens (blankets/sleeping bag). Linens package is $10 and can be purchased during Camp Registration. You can add linens at any time by visiting your ACTIVE Registration account. Linens can also be purchased at camp by card or cash. What workouts are done at camp? Each morning run features a 15 minute shakeout, followed by a tried-and-tested routine of core, flexibility, strides, and icing. Afternoon workouts performed during the 20-day RMXC camp include steady state runs, tempo runs, and long runs, with a strong emphasis on recovery and nutrition. How long is each afternoon run? Runners may run anywhere between 15 and 60 minutes during an afternoon run (excluding long runs), depending on age, experience level, and their particular training volume described by their home-coach. We’re happy to help guide athletes for their afternoon run distances. Long runs are generally 60+ minutes. The the trails and dirt roads are appropriate in difficulty for all camp ages and experience levels. There are also flatter, less hilly, and less technical options available for each run. What if I get injured while at camp? We have a staff of healthcare professionals to navigate injuries and get runners back running as soon as possible. We do have a spin bike and occasional swimming workouts. However, as this is a running camp, we want runners running. What lectures are covered at camp? So much more! See our camps page “Details & Itinerary” tab for the full list. Camp Activities - tentative and partial list! How much money $ should I send my camper with? All meals (breakfast, lunch, dinner), with the exception of the 4th of July dinner in Crested Butte, will be included, as well as water and Gatorade for the runs. The amount of money from that point is completely camper-dependent, based on what souvenirs they may stumble upon or snacks they purchase. Some campers do utilize the Walmart that is next to campus to buy snacks, power-bars, etc. We also have a Team Prep USA gear store with running accessories for purchase (shorts, shirts, recovery tools, hats, socks, etc.). Also be sure to bring quarters/dollars for the laundry machines! Rough estimate: $100 cash; each place is credit-card accessible. Is there a mailing address for Winter Distance Project? There is a $50 Early Bird discount that ends on 10/1 each year. What if I can only make some of the dates? If you can only make certain dates or have to leave early, you will still need to purchase a full ticket. What needs to be to Team Prep USA by December 10th? Are Letters of Recommendation necessary for Winter Camp? Shuttles from Tampa International Airport are $25 each way. A Cedarkirk Conference & Camp employee will meet campers at Tampa Intl. Airport, will have a sign, and be wearing Team Prep USA gear. ​Unfortunately, we cannot house campers outside of the camp session dates. Boys and girls will be housed in separate lodges. Each lodge has several rooms with several beds - rooms house between 2-4 campers. Do I need to bring linens/bedding? Linens are included at Winter Distance Project. Bring extra blankets if you'd like, but we've got you covered! Each morning run features a 15 minute shakeout, followed by a tried-and-tested routine of core, flexibility, strides, and icing. Afternoon workouts performed Winter Distance Project include steady state runs, tempo runs, and long runs, with a strong emphasis on recovery and nutrition. Runners may run anywhere between 15 and 60 minutes during an afternoon run (excluding long runs), depending on age, experience level, and their particular training volume described by their home-coach. We’re happy to help guide athletes for their afternoon run distances. All meals (breakfast, lunch, dinner) will be included, as well as water and Gatorade for the runs. New Years at Busch Gardens ticket is included.